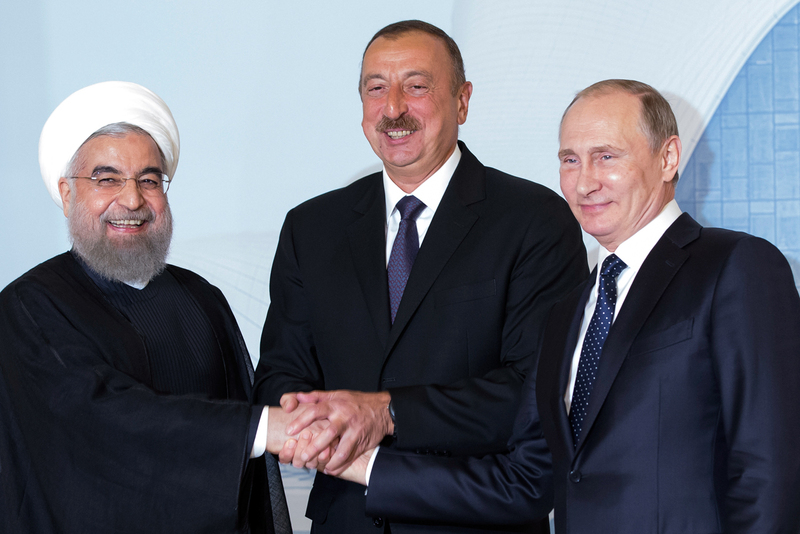 Iranian President Hassan Rouhani, left, Azerbaijan's President Ilham Aliyev, center, and Russian President Vladimir Putin pose for a photo during their meeting in Baku, Azerbaijan, Monday, Aug. 8, 2016. Leaders of Russia, Iran and Azerbaijan met over the weekend and signed a declaration in Baku on Monday, pledging to develop trilateral political and economic cooperation. The latter includes completion of the ‘North-South’ Transport Corridor. Russia, Iran and Azerbaijan are going to finish building the transport corridor, which will connect the Persian Gulf countries with Russia and the European Union. Usage of the North South corridor may raise political differences between the participating countries. The leaders of Russia, Azerbaijan and Iran signed a declaration in Baku on Monday, aimed at development of trilateral cooperation in the political, trade and economic spheres, and in combating terrorism. The document talks about the three countries’ desire to diversify traffic flows and the means of delivery of goods "on the basis of principles of market economy, free competition and mutual benefit." “The parties will continue to reciprocally promote implementation of the new projects for connection of the railways within the framework of the "North - South" international transport corridor,” states the text of the declaration. Iranian President Hassan Rouhani met with Azeri President Ilham Aliyev on Sunday, after which they designated a key objective of the Baku summit; agreement on completion of the "North - South" international transport corridor and consolidating this goal in the declaration. The "North - South" international transport corridor is expected to be even more convenient than the sea route through the Suez Canal and considerably less expensive for transport of goods. They agreed to finalise completion of a particular section of the corridor, from Rasht (Iran) to Astara (Azerbaijan), a stretch of 172 kms. This part of the transport route is the missing link for the direct rail link from the Persian Gulf to Europe. Goods are now transported through this corridor and, after this declaration, the Russian Railways can also participate in it. The volume of traffic in 2015 amounted to 7.3 million tonnes. After connecting the railway lines, the cargo flow could rise to 10 million tons per year. The entire "North - South" corridor will be 7,200 km long, "Russian Railways" (RZD) representatives have explained. The corridor will connect Russia (St. Petersburg) with Mumbai in India. Transportation along this corridor will remain multimodal, using not only the railway, but also road and sea transport. Mohsen Pakayin, the Iranian Ambassador to Azerbaijan, gave details about what he called the "project of the century," on the eve of the summit. He estimated that the project would cost $1 billion. Iran and Azerbaijan will invest at least half. The Czech Republic and Hungary have also showed willingness to participate in the construction of the Rasht – Astara railway, said the Ambassador. Azerbaijan plans to complete construction of the Astara railway by the end of 2016. "For example, goods from India will be sent by sea to the Iranian port of Bandar Abbas in the Persian Gulf, and then delivered to Rasht by train, from there, they will be taken to Astara by truck, through the Azerbaijan railway network to Russia or in the other directions," said Pakayin. The "other areas" he refers to are eastern and northern Europe. Pakayin also said the Qazvin to Rasht segment is another unfinished railway section within the same project is. It is 93% ready and will be commissioned by March 2017. The intention to combine the separate sections of the railway line and to create a single transport corridor from Russia to Iran to Azerbaijan has been discussed for almost 10 years, and has been in the works since 2008. If implemented, it will primarily be due to Iran and Azerbaijan. Russia has no extra money. "After the removal of sanctions, Iran started making money on the sale of oil, it is increasing its production, and therefore looking for new markets and is ready to invest in large-scale infrastructure projects," said Dmitry Abzalov, president of the Centre for Strategic Communications. For Russia, the "North – South" corridor line has the potential to increase trade with the Gulf countries and India. However, it is likely that China, rather than Iran or Russia, may become the primary beneficiary of the project. "If China sees that this highway is the most convenient and fastest way to the European market, Chinese exporters will turn the ‘North – South’ corridor into a part of the Silk Road", said Abzalov. The Baku corridor can also be viewed by Beijing as an alternative to the Straits of Malacca, China’s main transportation artery. If China’s relations with the South Asian countries deteriorate, it may be more beneficial for it to make its way to the EU through the "North - South" land corridor, argues Abzalov. "For Russia, it is important to be part of this project, in view of the increasing trade flows between South East Asia and Europe. Russia's participation in the implementation of the transport corridor project strengthens Russia's position in bilateral relations with China, "said Yaroslav Lissovolik, chief economist of the Eurasian Development Bank. The stakeholders’ political ambitions may prevent this project from being implemented. Iran, for example, has made it clear that it is not prepared to unequivocally support Azerbaijan’s position in the Karabakh conflict. A joint manoeuvre between Iran and Armenia is, however, a blow to "Gazprom" interests in the Caucasus. Not to mention that Russia may not want, in principle, to allow Iranian gas to European consumers. No one can guarantee successful completion of the international transport corridor, said Lissovolik. Europe may regard Moscow's efforts in this region as yet another attempt to put pressure on Brussels through its Asian partners. The "North - South" may remain a regional project developed by three countries. "But common sense can also prevail. A transport Corridor of this scale may be beneficial for Europe, it will ensure the diversification of trade flows, not to mention the fact that the European market has been traditionally interesting for Azerbaijan, Iran, China and, certainly for Russia," Lissovolik said.